Sure, I did not like Emdin’s using my ethnicity like a target on my back. I felt for the first time in my life my skin color in a way that made me feel uncomfortable, which people of color I’m sure have felt since their earliest memories. Taking Emdin’s premise as a judgment is the type of static, fixed-mindset thinking that makes education stagnant and inaccessible to some students, the same model that teaches all students as if they come from the same backgrounds and have the same needs. I needed to view it as a challenge to better myself and my practices. Extending this to my disciplinary practices in the classroom, I have taken a while to come around to the realization that my autocratic style and my at-times negative means of “motivating” students have not given them the complete models they need for long-term, sustainable success, for they might know what not to do, but they do not know how to make it better. Another Aha! moment: Emdin got me thinking back on my time at Central High School in Bridgeport, CT, where the school was over 90 percent of color and impoverished with an even higher percentage of all students on the free breakfast and lunch program. I remember one of my main motivators was telling the kids something like, Education provides you the chance to better your position in life. You can get out of here. Although I might not have seen it then, I did pity my students as less fortunate than I was. I did feel as if I wanted to work my hardest to give them better learning opportunities – really the opportunity to have a future outside of their home community – and better opportunities to become someone else. Knowing that I built a rapport with my students at Central based on mutual respect and tangible, challenging, beneficial work, I can still see my faults. The view of education I was presenting was not one of inclusivity, which finally provides an explanation for why some of my students used to ridicule their peers for “acting smart” or “acting white.” According to Emdin, “Scholars argue that black youth view doing well in school as acting white, without considering that teachers may perceive being black as not wanting to do well in school. The issue is not that youth of color see academic success as limited to whites. 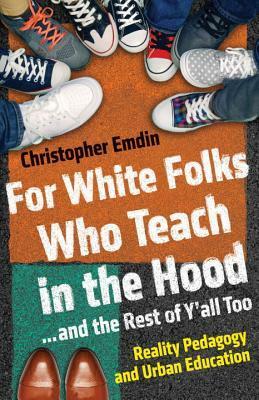 It is that they typically see white teachers as enforcers of rules that are unrelated to the actual teaching and learning process” (34). Though my intention was to model best practice techniques of productive students, at times I could have been forcing my single-minded beliefs about what a student should be on them. What I missed was the fact that just because I excelled in school utilizing certain techniques did not mean they would, whether that was because of a lacking foundation in the fundamentals or poor, possibly historical, experiences with school systems. The answer was not Too bad, so sad, you fail, which I originally thought it was because that’s how it was when I went to school. No, the answer was then and is now What plan can we put together that works for you to ensure immediate and long-term progress. As if I was trying to cover a topic in the classroom to get through it as opposed to taking the time to ensure the students understand. Or, to use a cliche, like trying to bang a square peg into a round hole. Rose-colored glasses removed, I know I will continue to improve and do the best for my students. It just took a little discomfort and self-reflection to get there. What I assure you will not change, however, is my unyielding belief in the potential of all of my students and my equally unyielding drive to ensure they reach it. Check back on 8/15 for my major misgivings about some of Emdin’s contentions.